In this photo taken November 21, 2009 released by Habitat for Humanity, former U.S. President Jimmy Carter, right, holds the hand of his wife Rosalynn as they visit the Damnak Thom village where Habitat for Humanity volunteers built 21 houses, file photo. As America again focuses on the issues of race and discrimination, an old voice has joined the conversation. Last month marked the release of former President Jimmy Carter’s 29th book, A Full Life: Reflections at Ninety. He opens up about his early life on a Georgia farm in the segregated south and how his mother influenced his views on race. “She reached out more generously to the black community. Mother set an example for that, and Daddy permitted her to express her views by action,” said Carter to the Philadelphia Inquirer. Despite being a segregationist, Carter’s father is featured in the book as an influential character in his life as well. Even a poem penned by Carter is included. 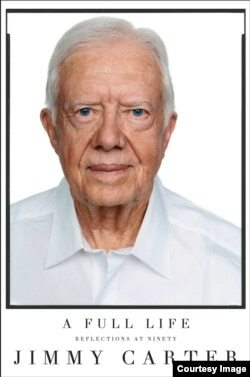 President Jimmy Carter’s 29th book, A Full Life: Reflections at Ninety. He felt “a hunger for his outstretched hand, a man’s embrace to take me in, just a word of praise,” Carter writes. Carter details his pre-presidency political career in the memoir, including his denouncement of racial discrimination as governor of Georgia. The country is not healed with the passage of the Voting Rights Act and the end of 100 years of segregation, said Carter in an interview with Judy Woodruff of PBS. “I think the recent high publicity about the police and black confrontations and the tragedy in Charleston have reminded us that we still have a long way to go. There’s still an innate racism in our country that needs to be addressed accurately,” said Carter in the PBS interview. Carter’s paintings speckle the pages of A Full Life, illustrating key people and key events throughout his life. He even includes a self-portrait from April of 2009, which depicts Carter at work in his studio. Carter’s wife, Rosalynn Carter, makes frequent appearances within the memoir’s pages. “To Rosalynn, who has kept my life full of love,” writes Carter in the book dedication, the release aligning with their 69th anniversary. Published by Simon and Schuster on July 7, the book is now available for purchase on their website.